holding an eagle-tipped sceptre in his right hand. TXXI in Exergue. V in right field, star in left field. Salus standing right feeding serpent in her arms. 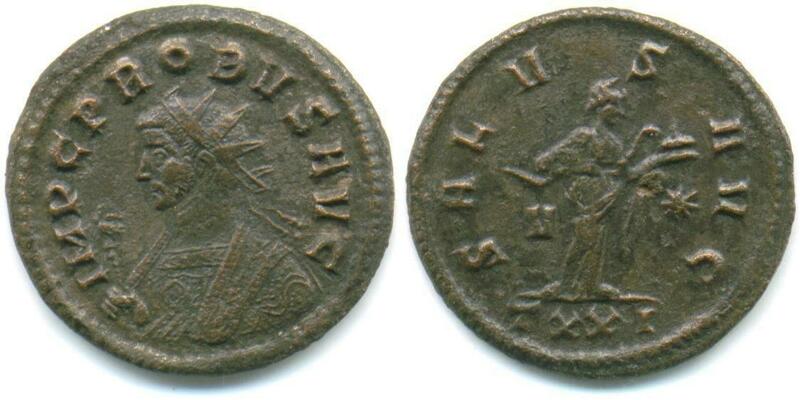 Minted at Ticinum (Pavia, Italy), 10th emission, 3rd officina in 281 A.D.
Van Meter, D., "Handbook of Roman Imperial Coins", p262, nr 43, variety Ol/3a.